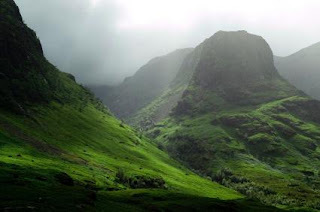 As a McDonald, Glencoe has a very strong connection with my ancestry and the massacre that took place here on 13th February 1692. But today we will talk about Glencoe itself, as it is one of the most beautiful places in Scotland and is without doubt, one of Europe's scenic highlights. At times it is a haunting beauty and earns it's title of "the valley of the weeping" but at all times it is breathtakingly beautiful and serene. My first sight of Glencoe was in the spring. The bracken fern turns a golden color in the winter and combined with the silver birch and their new purple buds sets up a pallet of remarkable colors. The sky is brilliant blue and lends its color to the ponds that shimmer all along the top of the pass. The ponds are ringed with white sand and the effect is dazzling. Golds, purples, blues, silvers and white all trying to out do each other in there struggle to break free from winter's tight embrace. The colors change as we pass from spring into summer and the bracken begins to stand up and turn green again as the purple of the heather breaks out of its browned confines. The yellow of the gorse is startling against the crisp green hillsides and the pools of blue darken and lighten as the clouds float lazily by. Could there be anything more spectacular? I truly did not think so until my first trip through the pass after a light dusting of snow. The sparkling white of the hills with the massive angular peaks breaking through was a contrast of colors that delighted and amazed. The deep dark blue of the ponds in striking contrast with the pure white snow defied description! Is is any wonder that this area has wrought so much myth, legend and history? It is easy to understand Robert Louis Stevenson's inspiration for Kidnapped as well as a Hollywood background for much of the Highlander series, Braveheart and Rob Roy being filmed here. With so much of natures abundance in one unspoiled and unforgettable location, one thinks at first that it would be best kept a secret. But the best things in life should be shared and I love sharing my Scotland with you!